Now that the weather is becoming warmer and hay-fever season is upon us, you may have noticed that your dog has started to itch. This may be observed as scratching, rubbing, licking or shaking parts of their body. You may have noticed that their skin has become pink or red or has ‘dandruff’. It is best to consult with your veterinarian to determine the cause of, and appropriate treatment for, your dog’s itchiness. If your dog is diagnosed as atopic the vet may prescribe tablets or creams to help control your dog’s symptoms or suggest immunotherapy to desensitise the dog to the things that irritate them. In addition there are other adjunctive therapies that will help soothe their skin and may reduce how much medication the dog needs. The more of these adjunctive therapies you can employ the better the outcome you can expect. Below is a description of some suggestions. The best way to avoid itchy skin is to avoid the things that your pet is allergic to. If you have done allergy testing you will know what these are but if you haven’t you can still try to avoid the most common environmental agents that cause atopic dermatitis in most dogs. These are fleas, dust mites and grasses. As flea bites are highly likely to cause a flare up of your pet’s allergies it is best to prevent flea infestation. We recommend a monthly or 3 monthly chewable tablet such as NexGuard® or Bravecto®. View our article on the latest on fleas and how to protect your dog from flea infestation. There are many flea treatment products on the market. Our receptionists and nursing staff are up-to-date with the latest products and can advise you on the best treatment for you and your pet. Shampooing your dog after exposure to irritants such as grass or carpets(dustmites) can help to remove the allergens from the dog’s skin and reduce flare up of the allergy. Regular shampoo therapy will help the majority of atopic dogs. Ideally the shampoo should be left on the skin for 10 minutes followed by a 10 minute rinse. Medicated shampoo such as Malaseb® should only be used on dogs with recurrent skin infections but oatmeal based shampoos such as Aloveen® can be used weekly on all other dogs. We provide a hydrobath service at the clinic that you can use yourself or book in with one of our groomers to bath your dog. They are always available to give you advice on shampoos if you choose to DIY. The outer layer of the skin is made up of cells and lipids(fats) which provides not only a physical barrier to the external environment but also plays a role in the body’s immune response. This barrier prevents excess water loss from the skin, maintains body temperature and provides a defence against antioxidant, UV and physical damage. It is important that this barrier is functioning at its best in atopic dogs. After shampooing you can use a leave in conditioner to help repair the skin’s barrier function. The skin has a layer of lipids (fats) that provide a barrier between it and the environment and when this is damaged through excess wetting (licking, swimming) or by trauma (scratching) the allergens can enter the skin freely and cause irritation. Products such as Aloveen Conditioner ® or PAW Nutriderm can be used after shampooing or in between shampoos as a moisturiser and will help repair barrier function by reintroducing these lipids to the skin. Adding Omega-3 and Omega-6 fatty acids to the dog’s diet will also help improve barrier function and hence reduce the occurrence of skin flare ups. 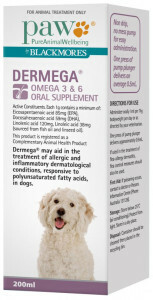 You can add these fatty acids to the pet’s usual food in the form of an oil such as Megaderm® or PAW Dermega®. They should be included in your pet’s food every day. Alternatively your pet may benefit from being fed a specialised diet designed for dogs with atopic dermatitis. These foods already have the correct balance of Omega-3 and 6 fatty acids in the food along with other antioxidants and even antihistamines. Such foods include Royal Canin Skin Support or Hills Sensitive Skin. So, as you can see there are many things you can do to help your itchy pet and hopefully reduce the need for medications that can have quite serious side-effects. All these products are available over the counter and are found in our reception area of the clinic. If you need further help with your itchy pet then please make an appointment with one of our vets to discuss your treatment options.